We are encouraging our fellow bloggers and everyone to take part in this joint effort to help Yolanda victims by donating a hygiene kit to the victims particularly those who are currently in the evacuation centers. This donation, no matter how small it is will take a long way in helping the victims to at least cope up with their basic needs and help them protect themselves from sickness due to their uncomfortable conditions in the evacuation centers. A conscious effort is now being undertaken by the Davao Bloggers Society and Filipino Bloggers Forum to join the relief operations by raising a total of P100,000.00 to finance and produce 1,000 hygiene packs for the victims. 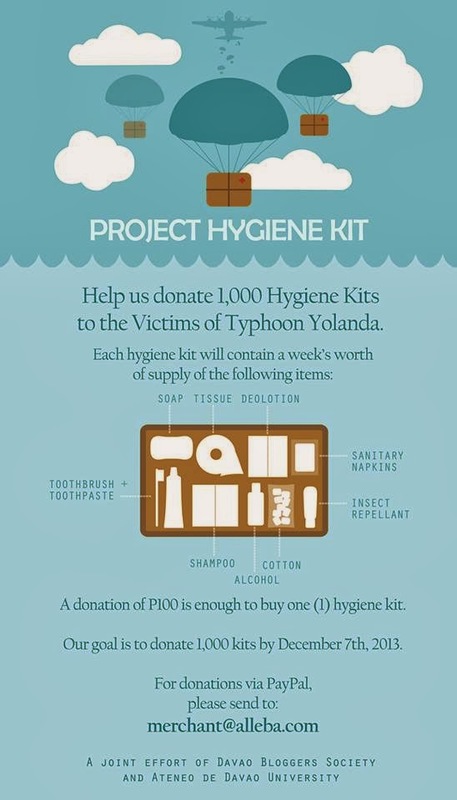 Each kit costing to PHP100 or USD2.50 will contain toiletries and other essential goods for a week’s use of one person. Hygiene kits were chosen to be donated as this is something that is not yet prioritized by many donors. Thank you very much for posting this Sis. I'm sure this little effort could do a lot in the lives of the survivors in Visayas.